The year of 1990 didn’t mark a new decade alone. Multiculturalism and its characterization through alternative media were fast on the rise. In urban culture, the soundtrack was Swingbeat, a composition best described by its architects as “organized noise.” Having only taken root several years prior, this fusion of R&B, Hip Hop, and Funk was at its peak, and poised to become the multimedia powerhouse known as New Jack Swing. No one—not even its detractors—could deny its commercial influence on music, television and film. Many artists of this genre experienced groundbreaking success. Some crossed over into acting and fashion, and enjoy lucrative careers to this day. But there were also tragedies and short-lived stars. LaTasha Sheron Rogers, better known as MC Trouble, became Motown Record’s first female rapper around the age of 18. Showing promise and artistic merit, she wrote, arranged, and produced her first and only album entitled Gotta Get a Grip (1990), which spawned the minor hit single “(I Wanna) Make You Mine” with R&B trio The Good Girls. 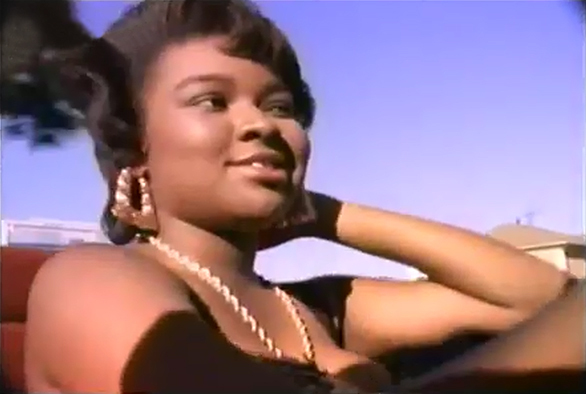 Screen capture from MC Trouble’s Highroller’s Girl video. But it was her gift of rhyme that completed this synergy. Trouble’s lyrics were remarkably pointed and aggressive. They distinguished her from her contemporaries and paired her with the likes of Rhyme $yndicate, a hip hop collective with ties to rapper and actor Ice-T. 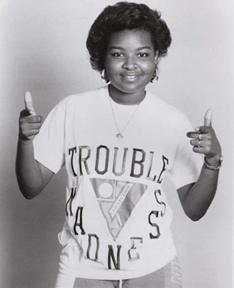 Dubbed “Rhyme Syndicate Princess,” Trouble would go on to collaborate with actor Malcolm Jamal Warner, who directed the video for “Gotta Get a Grip,” the album’s politically-charged title track. It is also worth noting that Gotta Get a Grip was not her only work. 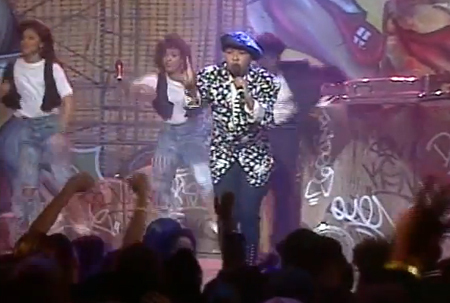 According to an episode of “Pump It Up” with television personality Dee Barnes, Trouble’s “Highroller’s Girl” was a local hit in Los Angeles during the fall of 1989. The track, along with another one called “Can’t Get Enough,” would appear on the What Does It All Mean (1989) Motown compilation with Greg Mack, of KDAY 1580 fame. Trouble’s other features include an EP / 12″ single entitled Highroller’s Girl (1989), and an impressive guest performance on Jazzie Redd’s “Think,” from his album entitled Spice of Life (1990). Unfortunately, an inoperable brain tumor would cut her celebrity short. On June 4, 1991, Trouble suffered an epileptic seizure and died in her sleep shortly after. News of her death shook the Hip Hop community and prompted a host of tributes: The most significant being Nikki Kixx (Trouble’s litter sister) and Nefertiti’s segment during the Sisters in the Name of Rap (1991) concert. At the time of her death, Trouble had been working on her sophomore album, purportedly titled Trouble in Paradise. This inscription would ultimately serve as her epitaph. It’s easy to speculate what might have been had Trouble lived and developed as an artist. Surely, her array of talent would have placed her among Hip Hop’s elite. When measuring the success of her contemporaries, a la Queen Latifah, MC Lyte and Sister Souljah, that speculation becomes an almost certainty. Still, others suggest that while Motown looked to Trouble to boost their credibility in Hip Hop, her lone album was a minor hit that didn’t reached the bar. Indeed, critique is where the story of MC Trouble shines brightest, bearing striking resemblance to New Jack Swing, the era in which she developed. Both were short-lived, climaxing just years into a decade that would convene the MP3 and World Wide Web. Both were representative of alternative and multimedia. And while both provided soundtracks to urban culture, the impacts of their contributions were long-lasting. We can thank that era, to which Trouble is linked, for today’s admixture of Hip Hop and R&B, and the multi-faceted art we’ve come to expect. It is undoubtedly Trouble’s place in urban music history.